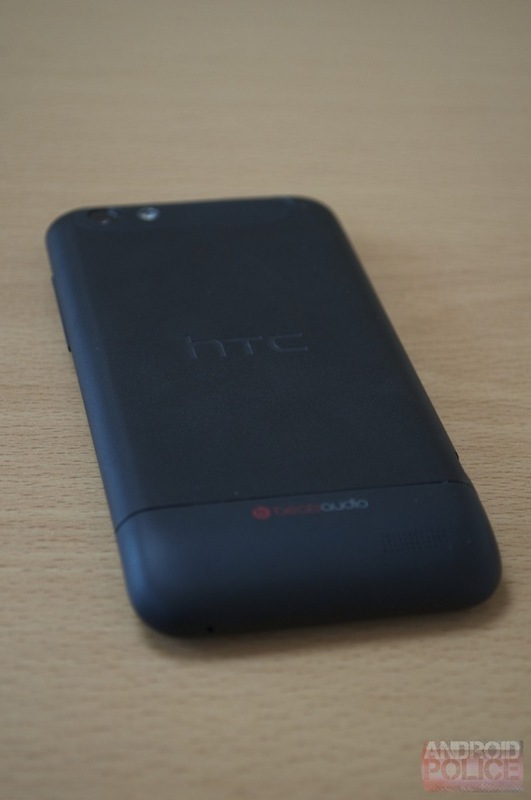 HTC One V Review: Can A Cheap Phone Really Be Cheerful? 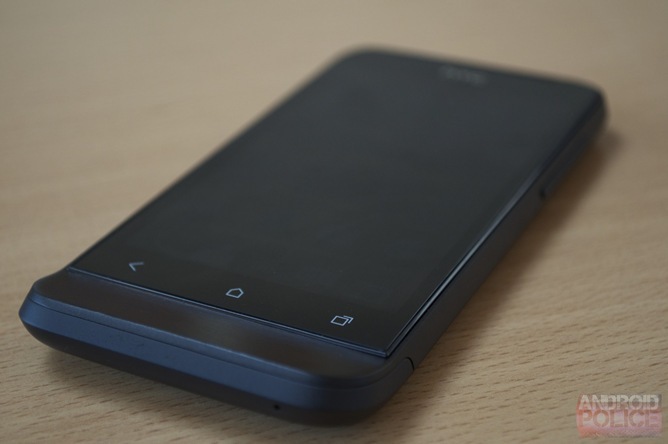 There are many cheap Android phones on the market today. Most of these devices will have a single core processor clocked at around 1GHz, and there won't be an awful lot of RAM to speak of either. This remains true of the HTC One V, but the latest budget phone to come out of the Taiwanese company has one key difference: it's running the latest version of Android. That's right, you can finally own a budget device that doesn't ship with a version of Android that was released 2 years ago! Before you start celebrating too soon, though, you may want to take a look at some of the pros and cons that come with this phone and decide whether you want to take it on a 2-year contractual spin. Before we get to the review, let's take a look at the One V's specs. Build quality is solid for a phone with this price point. The notification LED is really useful for seeing notifications without turning your screen on. Despite the underpowered CPU, performance isn't at all bad. Even though it only has 512MB RAM, you can easily multitask with half a dozen apps open. Good battery life. You'll easily be able to get through a full day on a single charge, and standby time is fantastic, lasting up to 4 days. 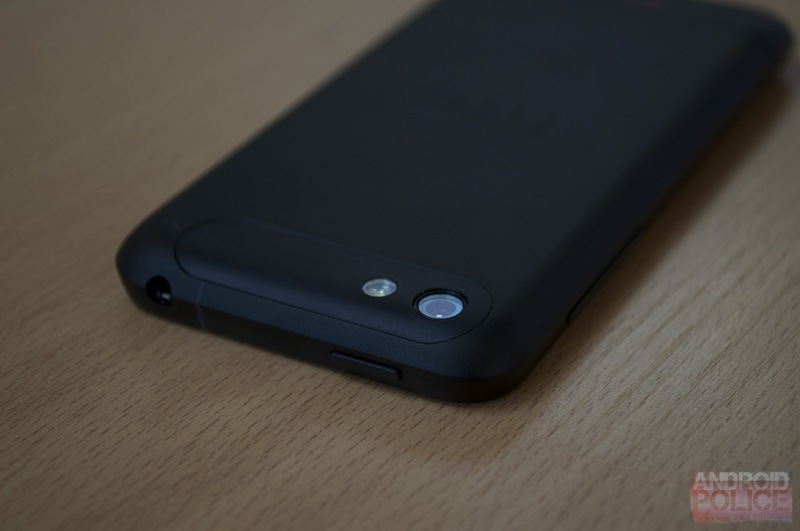 The SIM cover doesn't fully close against the back of the phone, leaving an unsightly gap. There is no front facing camera, and using the camera in the dark results in shots that lack detail and blur on any light objects in the flash. BeatsAudio doesn't live up to its name. The battery is non-removable, so swapping batteries on the fly is a no-go. Like the One X, the phone comes with hardware buttons, but no hardware menu button, so the software button strip appears in apps anyway. This means that you lose screen estate and have a larger bezel as well. The main issue that I have with budget phones isn't that they may occasionally suffer from a bit of a lag when you're running multiple applications. Nor is it that they often run software that's outdated before the device is even released, although this is inexcusable. It's that they feel like crap in your hand. The plastic used on low-end phones often feels flimsy and flexible, particularly over the screen and on the battery cover. Thankfully, you can't say those things about the One V. HTC has managed to produce a phone that, in the grand scheme of things, costs very little, but still doesn't feel like a budget phone. 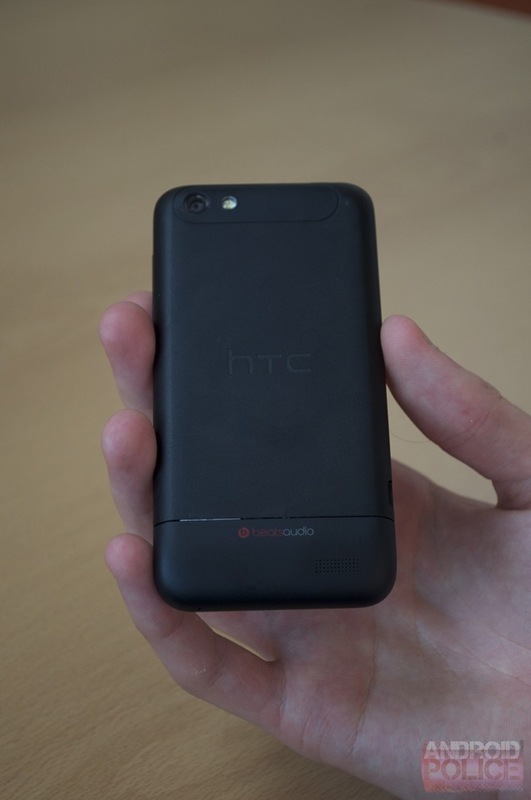 The plastic body feels solid and well finished, as does the material that protects the screen. Although I'd rather not test my theory, I'm pretty sure that this phone could survive a drop or two. Curiously, HTC decided to wind back the clock a little when it was designing this new phone, as it features a chin below the screen, à la Hero. That's where the comparisons end, though. You won't find a rollerball on the One V, and the physical buttons have been replaced with three capacitive ones. Like the One X, the One V comes with both Ice Cream Sandwich and hardware buttons as well. The buttons have been slightly altered from HTC's last generation of phones, with three buttons below the screen: back, home and recent. 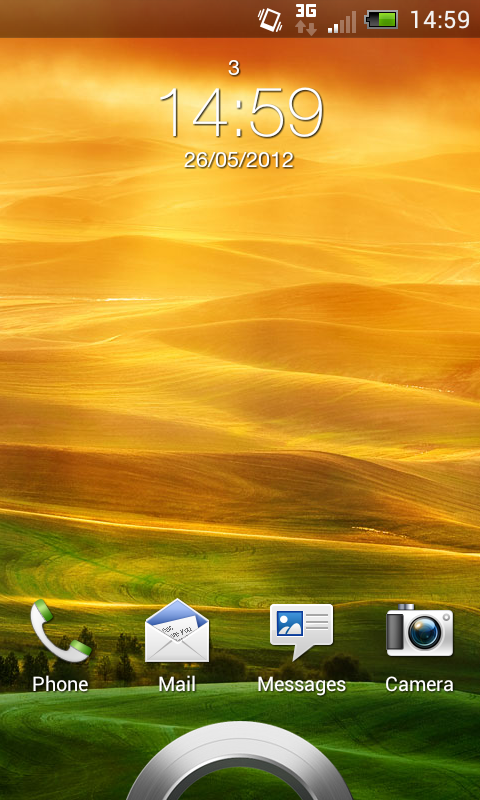 The removal of the menu button makes sense, as Ice Cream Sandwich has a built in menu bar that appears at the bottom of the screen whenever you launch an app. In theory, this sounds fine. In reality, it's a nightmare. The menu bar feels intrusive in itself, but that isn't the main problem here; the problem is that in addition to losing screen estate to the menu bar (and don't forget that this is a 480 x 800 display, so screen estate is very important), you've already gained an inch or two below the screen to accommodate the existing hardware buttons and the chin. Suffice it to say that this doesn't make for the best user experience in the world, and it can be frustrating at the best of times. 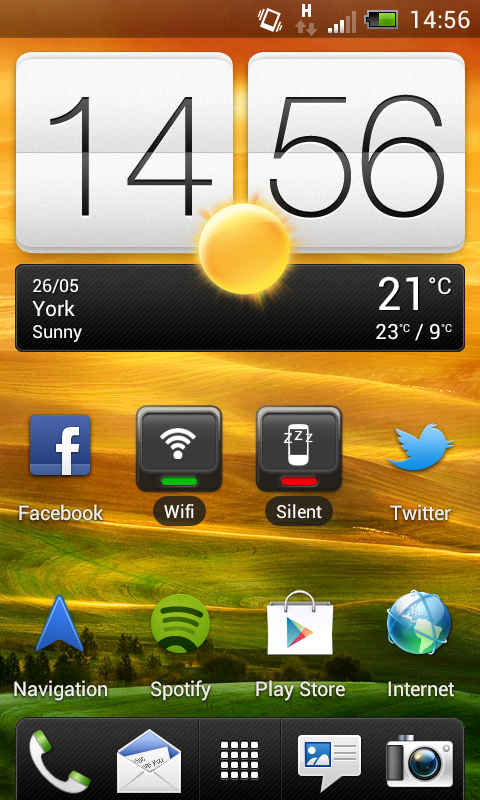 The multicolored notification LED above the display is a welcome addition to the phone, as it's something I've found essential ever since I bought the Nexus One all those years ago. At a glance, you can see if there's something waiting for you, and if there is you can see what that thing might be. Sure, you can just turn your screen on and get the same information, but that's so much more intrusive than watching a small LED blink at the top of your screen. Like a few of HTC's phones, the top of the One V has a slightly gradient to it that makes it a little uncomfortable to press the power button on the top of the phone, as you have to wrap your fingers around before you can nudge the power button. It isn't a deal breaker, but it's certainly an annoyance, especially if you have small hands. As the chin below the screen makes it a little difficult for any ports to be placed at the bottom of the device, you'll find a microUSB charging port on the left hand side of the phone. Unlike other phones on the market, it doesn't have an annoying flap that you have to tease off before you can plug your phone in, so the whole experience is fairly frustration free. The volume rocker, as you'd expect, is on the opposite side of the device. I mentioned a little earlier how the build quality of the One V is superior to most other budget phones on the market. Although this is true, the demo unit that we were given did have one imperfection that was slightly annoying. On the back of the phone, at the bottom, you can slide off a small cover in order to access the SIM card and microSD card slots. Again, this is far less frustrating than some of the back covers on other phones which feel like they will snap when you touch them, but the cover doesn't fit flush to the device, resulting in a slight gap that ruins the aesthetics a little. You can clearly see this in the image below to the left where you can see the SD card peering out of the gap. Looking under the hood, the HTC One V is quite the juxtaposition against other devices we've seen recently, such as the Samsung Galaxy S III. You won't be finding a quad-core processor under this particular beast, but you will be greeted with the surprisingly capable 1GHz Qualcomm Snapdragon. Paired with 512MB of RAM, that doesn't exactly spell out 'multitasking party', but this isn't a phone that's tailored towards a power user. Although you'll find 4GB of internal storage, only 1GB can be used to store applications and other files outside of the SD card, so if you plan to install a lot of apps then you'll have to move a lot of them onto external storage. Going against the grain of the recent 'bigger is better' mentality that all Android phone manufacturers seem to have adopted when it comes to screen size, the One V has a comfortably sized 3.7-inch display. The result of this is a device that feels nice in your hand and, despite the chin, in your pocket. It's also allowed HTC to give the display a resolution of 480 x 800 without sacrificing pixel density, which is around 252 ppi. 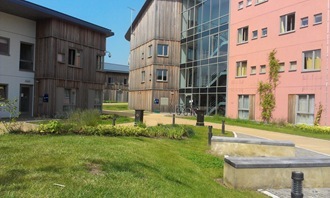 Images taken from the 5MP camera look sharp and detailed, although the colors are ever so slightly shallow. Still, with the click of a button in a photo editing application, photos taken on the One V can still pop with minimal effort (none of the photo samples below have been altered in any way). An LED flash accompanies the camera on the back of the device, but as with any smartphone, don't expect miracles when taking pictures in the dark, because you won't get to see an awful lot. 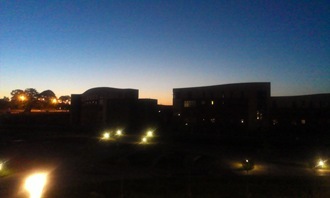 When transitioning from a light to dark gradient on an image, pixilation is obvious and unsightly, and any bright objects in the shot had a tendency to blur. You can see this in the image sample below where the lights are surrounded by an unnatural glow. Like every HTC phone that hits the market at the moment, the One V is marketed with Beats Audio. 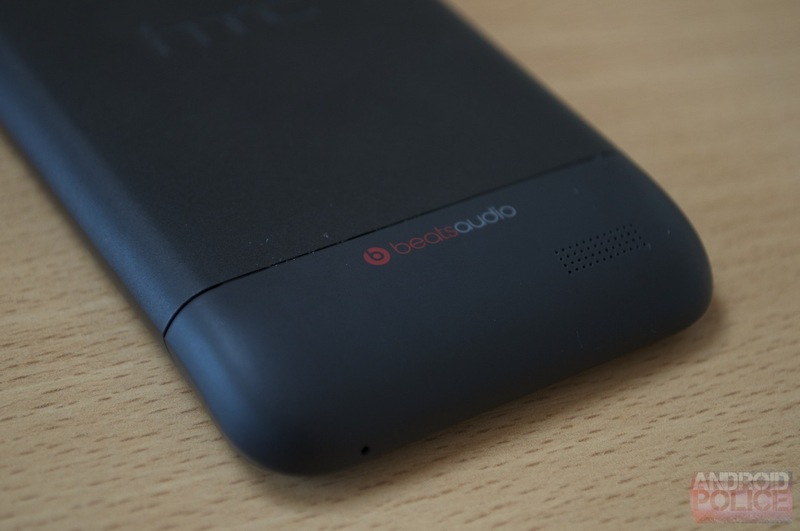 As HTC is no longer shipping Beats earphones with its devices, this now applies solely to the Beats audio profile (and that isn't saying much). Although the One V is a budget device, I had hoped that the audio coming from it would sound ok with some enhancements being made to the speakers, but unfortunately, this simply isn't the case. Sound comes out of a very small speaker grille at the back of the device, and it sounds tinny at best. Like with most smartphones, you're likely to get better sound from a cheap set of headphones, so unless you're really desperate to inflict your music upon the rest of the world, don't use the built-in speakers, especially if you're taking advantage of FLAC support in Android 4.0. The battery life on the One V is in line with most other phones on the market today, thanks to its 1500 mAh battery. It will be able to get you through the day without any problems, but you won't get away without charging it every night. I was able to use the phone moderately for a day, pushing Email and my Twitter feed, as well as streaming music over Spotify, and it had around 25% remaining when I got home after 9 hours. What impressed me most about the One V's battery was how long it could stay on standby without being charged. Before I started testing the phone, it was sat on my desk for almost 4 days without being charged, and it was still kicking when I picked it up. Unfortunately, unlike other devices you won't be able to remove the battery yourself. This means that you can't pack a spare battery and replace it on the go if you need to and if you've had the phone for a while and the battery needs replacing completely, you'll have a tough job on your hands doing it without sending it off somewhere. For me, this is close to a deal breaker. I can accept that no smartphone is going to have incredible battery life, and that I will probably have to charge it every night for the next day, but I like having the freedom to swap a battery out and replace it with another, especially if I'm going on a trip for a few days where I won't have access to power but still need to use my phone eventually. To test call quality on the One V, I made two phone calls: one indoors and the other one outdoors. Unfortunately, the sound coming from the call speakers on the phone is fairly poor. Before I even started speaking to anyone, the dial tone sounded overblown and was slightly uncomfortable to listen to, even at low volumes. At this time I had 4 bars of signal, so it wasn't a network issue. On the other end, I was told that I sounded clear whilst indoors, but as there is no noise-cancelling microphone on the One V, the person at the other end of the line struggled a little more when I was next to a road and open to the wind. We've already established that the One V is no powerhouse, but that doesn't stop it from running that latest version of Android. 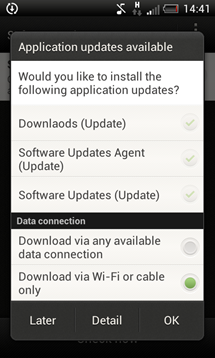 The phone ships with Android 4.0.3 pre-installed, so you won't be waiting on the promise of an update before you've even started to use it. With just a single-core processor and 512MB of RAM, I was sure that the software experience on the One V would be below par, but HTC has done a good job of making the phone usable, and it doesn't lag very often. When you turn the phone on, you will be greeted by HTC Sense 4.0, and I found it to be really snappy. 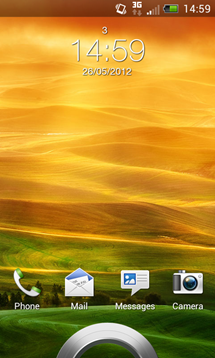 You can flick between home screens without any stuttering, and menus are quick to open and close. In order to save some processing power for use elsewhere, some of the bells and whistles have been removed from Sense 4.0 to allow the One V to run slightly faster. When you tap the weather widget on the home screen, for example, you will be taken to the weather app without the flashy full screen animation that users on more powerful phones will be accustomed to. The transitions between home screens are side-scrolling without any 3D effects, too, but this definitely isn't something that I'd miss if it meant that everything else on the phone was that little bit smoother. 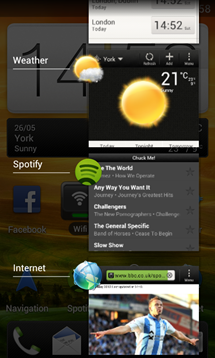 In many cases, the lack of flashy effects is a positive in the version of Sense that ships with the One V. If you're using Sense on the HTC One X, for example, you will find that the recent apps menu has turned into a cheesy cover-flow like display, with only one app being displayed at a time. 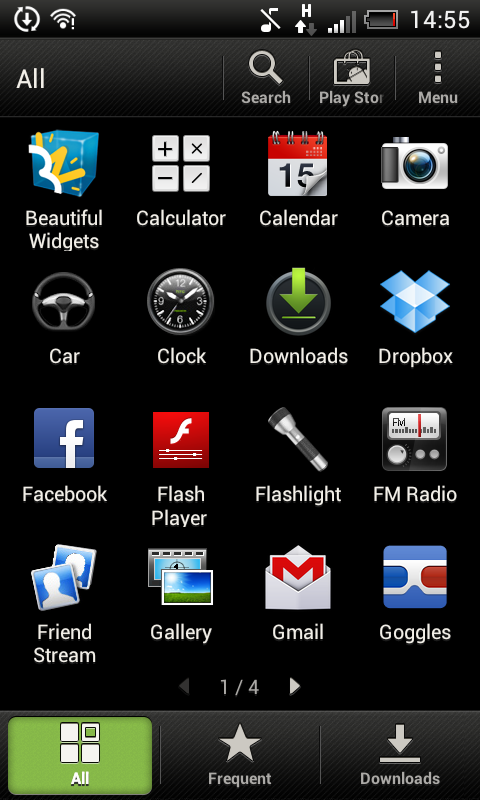 Call me crazy, but I definitely prefer the functionality of the stock Android recent apps list. When you start to multitask, things will inevitably become slower, but I could easily run over half a dozen apps in the background and everything was still very usable. If you're planning on playing some games on the One V, however, you might want to take it easy on the background processes. With 6 or 7 applications running in the background, Temple Run struggled ever so slightly when it had to deal with scene changes such as when you turned a corner or jumped over a tree. 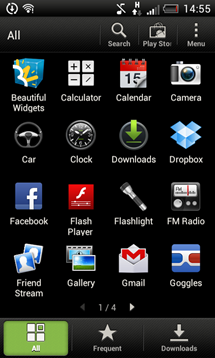 As you'd expect, you'll come across a few pieces of crapware that's built into most of HTC's phones. Ubuntu users will be familiar with 7digital, the online music store, where you can buy various songs and albums. Like most digital stores, prices here tend to be steeper than the same pre-owned CD, so if you can wait, just buy it physically and rip it yourself. It'll be better quality, too. Dropbox also comes pre-installed, but nobody's complaining about that when you get 23GB of free space just for signing in! Unfortunately, this 23GB will disappear in a year's time and you'll have to buy the storage if you're using too much, so keep an eye on how dependent you become on the additional space. 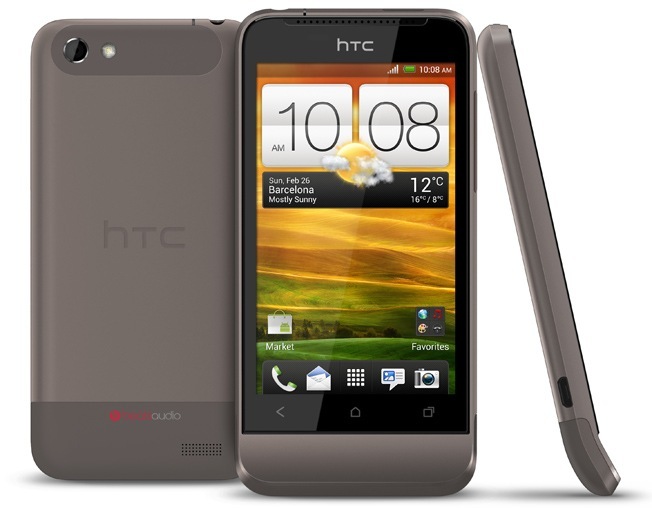 HTC Hub is essentially HTC's own app store, and will offer you a very limited selection of apps. You can't delete it, but just do your best to ignore its existence and use the Play Store instead; anything else is just unnecessary. I began this review by calling the One V 'cheap and cheerful', and that's exactly what it is. There's no doubt that this is an entry level smartphone - the specs sheet will tell you that - but with some careful refinements to Sense, HTC has managed to produce a phone that runs the latest version of Android well and doesn't cost a bomb. If you're on a budget, I wouldn't hesitate to recommend the One V over similarly priced competitors. 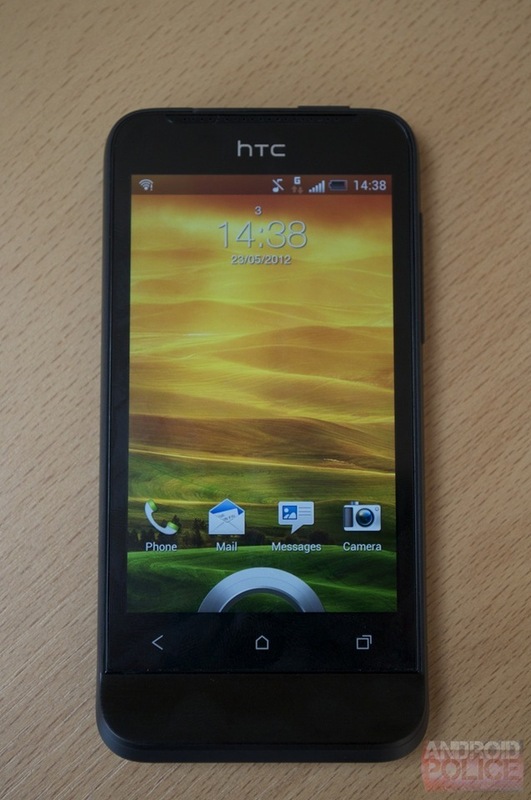 Off contract, the One V is a good £100 cheaper than the One S, and £200 lower than the high-end One X. 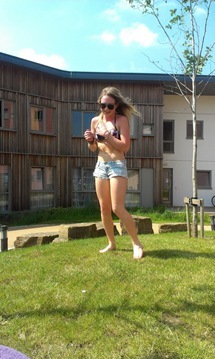 If you buy it with a pay monthly contract deal, you can get it for free from £25 with truly unlimited data on Three UK. If you want to shave a little off that price, then you can get it for £20 a month, also with unlimited internet, but you will have to pay £69 up front for the phone.